Geothermal Heat Pumps are self-contained units that efficiently heat and cool homes and commercial buildings while providing hot water. They use standard electronic thermostats and duct systems, making them appropriate for retrofits of standard heating, ventilation and air conditioning (HVAC) systems. Geothermal Heat Pumps can be sized to heat and cool any building in any climate. Geothermal Heat Pumps quietly and reliably harness the renewable energy generated by the Sun that is stored in the ground near the Earth’s surface. They make significant contributions to a cleaner environment by saving energy, cutting fossil fuel use, and reducing carbon emissions. 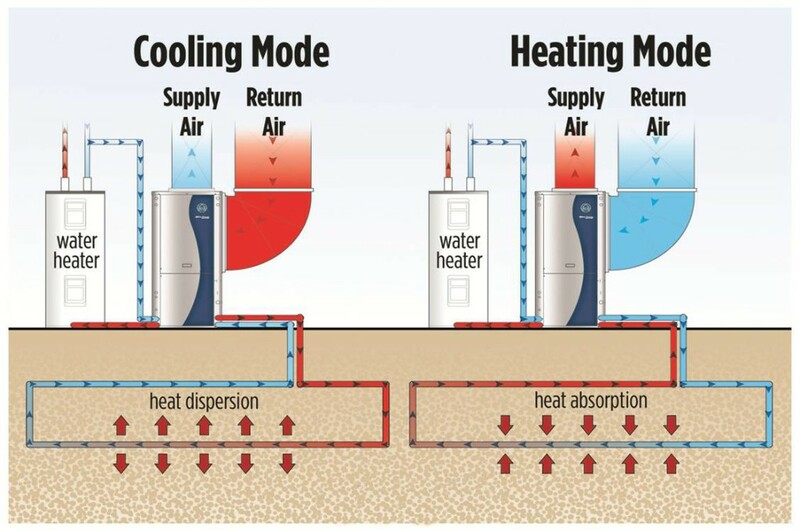 Unlike conventional heating and air conditions systems that use the outside air to absorb and release heat, Geothermal Heat Pumps transfer heat from and to the ground. They do that through closed loops of plastic pipes buried either horizontally or vertically in the ground below the frost line where the temperature is consistently between 40° to 80° F depending on where you live. Called ground loops, the pipes are sealed tight, and connected to the geothermal heating and cooling system inside the building. 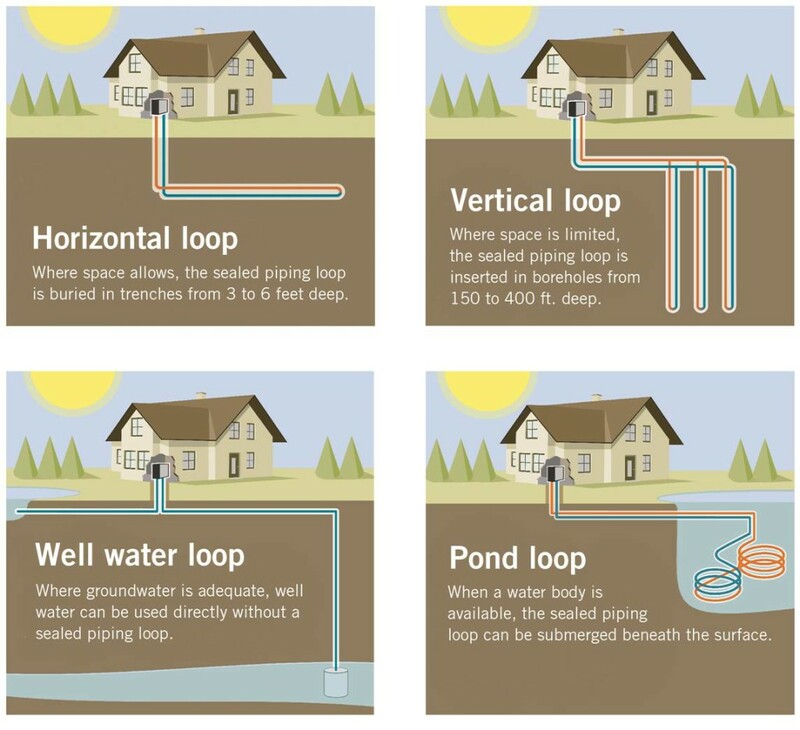 Water circulates through the underground pipes of the ground loop. During the summer months in cooling mode, unwanted heat indoors is transferred outside through the water in the pipes for cooling by the earth. The cool water is then circulated to the geothermal system indoors to provide efficient air conditioning. During the winter months, the process is reversed in heating mode. The earth heats the water circulating through the pipes, which is transferred to the geothermal system to provide indoor space heating. Hot water can also be provided for little or no additional monthly energy cost. 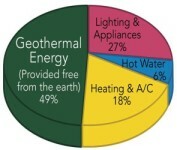 Geothermal heat pumps effectively address one of the biggest consumers of U.S. energy — buildings. Indeed, buildings dominate our nation’s energy use, devouring over half of our electricity and natural gas. 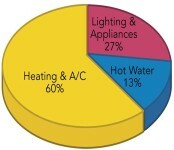 More than 70% of average energy demand for a typical single family home is to meet heating and cooling (thermal) needs. With a geothermal heat pump, that energy use can be cut by 40% to 70%, reaping significant savings on electricity and natural gas utility bills. 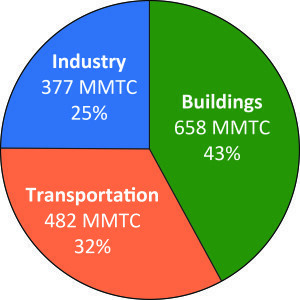 Building energy use emits 43% of total U.S. carbon emission. Though there is a higher “first cost” for Geothermal Heat Pump systems associated with excavation or drilling for installation of ground loops, energy savings can quickly make up the difference in system cost compared to installation of conventional systems. Energy savings “payback” for typical residential Geothermal Heat Pump installations compared to standard heating and air conditioning equipment is usually 4 to 7 years, and even less time than that with federal, state and utility rebates. Geothermal Heat Pumps are manufactured right here in the United States, with American labor and parts, and that spells Jobs. From innovative manufacturing through system design, systems for residential and commercial use are distributed and installed with local labor, creating an engine for economic growth. Geothermal systems spur the creation of skilled, well-paid jobs across the nation everywhere they are installed. Thousands of jobs can be created with increased deployment of Geothermal Heat Pumps. Geothermal Heat Pumps harness on-site renewable energy from the Earth and are a readily available technology that can be used everywhere. Geothermal Heat Pumps are truly a “50-State” renewable technology that provide large energy savings and complementary environmental benefits to both new building construction and retrofits for older structures.